unmatched speed, payload, altitude & endurance. Envisioning a better world and brighter tomorrow. The H2 Clipper can travel globe-straddling distances at speeds in excess of 200 mph using hydrogen-fueled high-bypass turbofan engines, which are modiﬁed jet engines. The lifting power of hydrogen provides the largest conﬁguration of the H2 Clipper with the ability to lift hundreds of thousands of pounds (inclusive of aircraft weight) at altitudes of 1,000 to 15,000 feet for ocean crossing transport. H2 Clipper is the only aircraft independent of fossil fuel produced from carbon sources. It is a clean, safe & environmentally friendly alternative to modern airplanes & cargo freighters, which pollute our atmosphere. The H2 Clipper is a revolutionary transportation system that will redeﬁne air travel for cargo and passengers in the twenty-ﬁrst century. It is a radical rethinking of a lighter-than-air, hydrogen-buoyed, hydrogen-powered dirigible, which uses no fossil fuels and has a host of commercial and humanitarian applications. We designed the H2 Clipper with state-of-the-art, patented technologies in aeronautics, materials fabrication, mass production and other disciplines. The internal structure is modular, we can build sizes ranging from 200 to 1,000 feet in length and up to 300 feet in diameter. The external skin is made of Kevlar impregnated with Teﬂon, to provide adequate lift for high-speed ﬂight with impressive snow and ice shedding ability. For thrust, the H2 Clipper uses rotating high-bypass turbofan engines that burn hydrogen in gaseous form. Computerized controls monitor and operate all of the H2 Clipper’s navigation, propulsion, mid-air collision, and buoyancy systems. 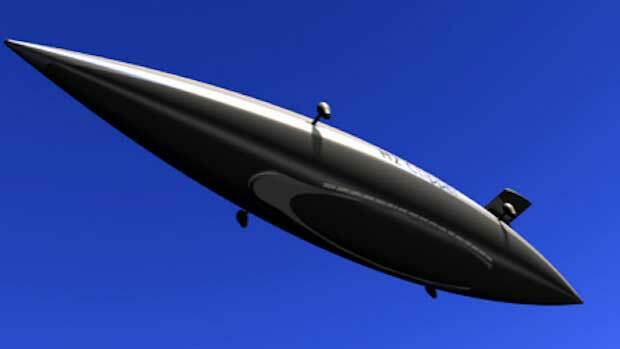 The H2 Clipper is a comprehensively patented, multi-use, high-speed, high-altitude dirigible that operates using only clean hydrogen for a “free” lift to altitude using 100% renewable energy. Vertical liftoff and landing capabilities of the H2 Clipper permit its use in remote areas without the need for airports or docks – it does not need the extensive infrastructure associated with airports and docklands. It will be highly effective in ﬁghting forest ﬁres or delivering water directly to areas affected by drought. In addition, it will enable cargo/freight transport in areas lacking sufficient capacity. Cargo ships at sea face constant pounding by harsh saltwater and waves. Traditional aircraft face jolts and cargo shifting during takeoff, landing, and in turbulence, which also causes tremendous stress and structural fatigue. The H2 Clipper operates in a much smoother environment; turbulent air has very little effect on it, and there is negligible shifting or bumping during takeoff and landing. The H2 Clipper travels vertically from ground to cruising altitude without burning fuel, instead, it uses the natural buoyancy of hydrogen gas for lift. After reaching a desired altitude, the hydrogen maintains a condition of neutral buoyancy to the ambient atmosphere. Since the H2 Clipper does not use wings for constant lift, it has much less drag, even when ﬂying at altitude. This results in far less in-ﬂight fuel expenditure than a conventional airplane. The H2 Clipper’s limited fuel use during travel, helps to keep fuel costs low. The ability to operate without extensive infrastructure enables minimal costs for ground operations. The very low drag and comparatively gentle environment in which the H2 Clipper operates means minimal maintenance costs. The United States Navy, at the highest levels, has concluded that hydrogen is the safest vehicular fuel they could use. Hydrogen safety tests have been conducted by ﬁring bullets at gas tanks of two cars: one ﬁlled with hydrogen and the other with gasoline. The car containing hydrogen released a small blue ﬂame that vented horizontally at rapid speed with no damage to the vehicle itself. The car containing gasoline produced an explosion and ﬁre that rapidly spread, totally engulﬁng the entire vehicle in ﬂames. A natural gas tank would have instantly blown up like a bomb. Hydrogen is by far the safer vehicular fuel. required to run Germany on solar and wind power. " H2 Clipper, Inc. is an aerospace development and alternative energy company utilizing existing technologies and innovative composite materials and manufacturing processes to build uniquely capable hydrogen-powered dirigibles.